From chicken tortilla soup to black-bean soup with avocado salsa, these Mexican soup recipes are perfect for Cinco de Mayo. In this week's episode of Mad Genius Tips, F&W's Justin Chapple reveals how to make easy, no-fry tortilla bowls at home. After crunching through your fill of those, use leftover tortillas to make one of these incredible tortilla soups. This spicy and hearty, Southwestern-style soup is chunky with chicken and avocado, but it's the tortillas that give it a slight thickness and a special flavor. Here's a silky soup that doesn't rely on cream for its creamy texture; pureed avocados do the job nicely. It doesn't rely on long cooking for its full flavor, either—the soup's in the pot for less than ten minutes. Corn tortillas help make this soup thick and hearty, and they also act as a crunchy garnish. This smoky, tomatoey tortilla soup is enriched with butter. This fiery, substantial soup is full of nutty-tasting barley, brown rice and bulgur, creating a dish that's high in fiber. 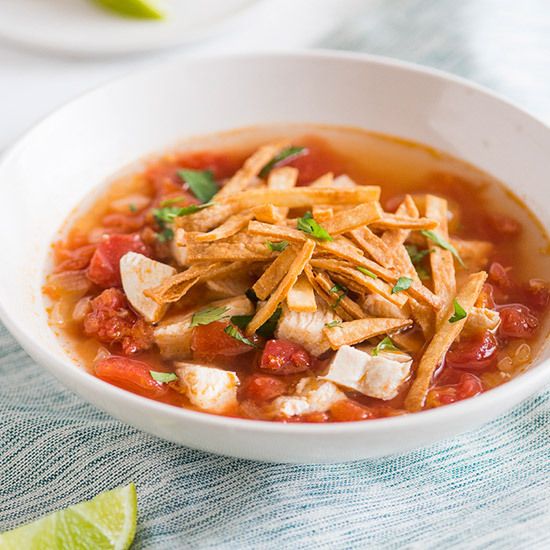 If you don't have time to fry your own tortilla strips, store-bought tortilla chips will work in a pinch for this vibrant, tomato-based soup.